Welcome to another edition of Feminist Friday, our weekly column where we share a handful of our favorite videos of the moment! This week, we’re focusing on intersectionality and women of color. These are the voices that have historically been marginalized, and it is more important than ever, given our political climate, to elevate and give space to these women, instead of speaking on behalf of them. First up, a documentary which should be on everyone’s radar – ‘Step’, from director Amanda Lipitz, released on August 4 in the US. This is the true-life story of a girls’ high-school step team set against the background of the heart of Baltimore. The all female school is making it their goal to have every member of their senior class accepted to and graduate from college, many of whom will be the first in their family to do so. Producer Ann Tisch, in an op-ed for the Huffington Post explains that the girls all attend The Baltimore Leadership School for Young Women, which opened in 2009, and was modeled on the school she founded in 1996 called The Young Women’s Leadership School of East Harlem. Today there are 13 affiliate schools around the country, with 18 schools that make up the Young Women’s Leadership Network, serving a total of 8500 students. While the step dance sequences will keep you hooked, it is the real life struggles of these teen girls that will make you realize the importance of narratives centered around women’s voices. 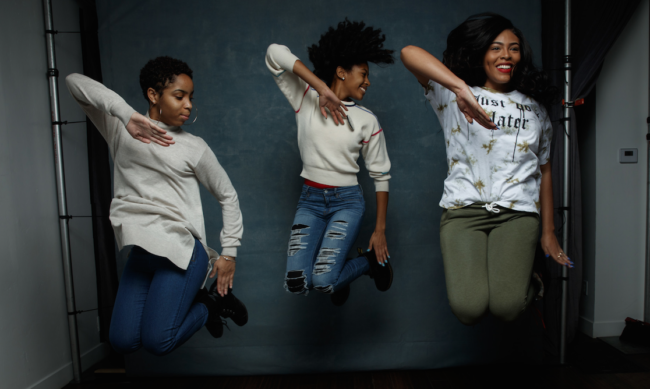 “When you meet Blessin, Cori and Tayla you will see exactly what the world should see more of: the power and promise of young women of color. Their stories are there in every corner of this country. However, most often, they are simply ignored…[these girls] and their families face the kind of systemic barriers and stereotypes, including racism and dire economic circumstances, which would derail even the strongest among us. Yet, like so many of our students, they do not succumb to the pressure of poverty or let it crush their dreams,” writes Ann. Our second video comes from hijabi rapper Mona Haydar, who is most known for a previous video of hers which went viral, called Hijabi (Wrap my Hijab). Now the artist is back with yet another in-your-face music video called ‘Dog’ which features ‘Orange is the New Black’ actress Jackie Cruz who plays Flaca. This track is all about calling out hypocrite Muslim men who criticize the lives and choices of Muslim women, while conveniently ignoring their own actions. Among her lyrics are lines where she calls out the men who are “obsessed with my (women’s) anatomy”, and who like to play morality police: “Emotional terrorist, thinking that you’re errorless, but you need a therapist”. Aside from being an artist who likes to disrupt and create nuanced dialog around Muslim culture, Mona has also been challenging stereotyped and negative conversations around the perception of Muslims with her husband Sebastian Robins, who converted to Islam in 2012 after meeting her. Following a few high profile terrorist attacks around the world over the past few years by the hands of extremists who claim they were acting in the name of God, Mona and Sebastian created the ‘Ask a Muslim’ booths where people could come up to the couple and engage in dialog about their faith. We love her way of using creativity as well as her musical talent to shine a light on an issue that is the cause of a lot of division today, politically and socially. She’s the kind of voice we want to support in the effort to see change in our political climate. Finally, a new video series from Dove for their #RealBeauty campaign. They have teamed up with TV mogul Shonda Rhimes for this project which is designed to shift the power of storytelling away from Hollywood and into the hands of everyday women. Dove are using an all-female crew for these videos, and drawing on research which shows the need for more accurate portrayals of women in media, film and advertisements. 69% of women agree that they don’t see themselves reflected in advertisements, movies, television. The definition of beauty is evolving faster than the industry can keep up with. 74% of women believe more needs to be done to redefine the current definition of beauty to be more inclusive. Many gay and lesbian women feel excluded from this narrative altogether – in fact, 3 out of 4 gay and lesbian women believe society suggests they do not care about beauty. “Meet Kylee” is the second film in this series, sharing the story of Kylee Howell from Utah. Growing up in a conventional town where feminine beauty was the norm, Kylee Howell felt it was impossible for her to embrace who she was. Finally, in her 20s, she decided to ignore ‘men’s only’ signs on barbershop doors, and get the short haircut that fit her identity. To help others on their journey to self-discovery, Kylee opened Friar Tuck’s Barbershop – a place where women can explore their own notions of beauty.